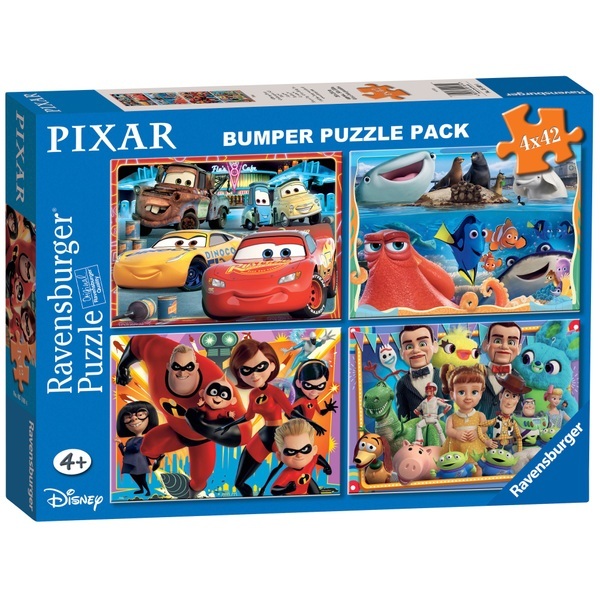 Ravensburger Disney Pixar 4 x 42 piece Bumper Puzzle Pack has colourful sets of puzzles with images from 4 of the most popular Disney Pixar movies. It features images from Finding Nemo, Toy Story 2, Cars and Monsters Inc. Each puzzle is cut to 42pieces. A lovely gift for Disney Pixar fans! Puzzles are made from a strong premium grade cardboard with a linen finish print to minimise glare on puzzle image.